Some time ago I did a study of Galatians and wrote my own notes on it. The notes are not in detail, but they are notes nonetheless! I will be sharing those notes with you over several weeks on Mondays. 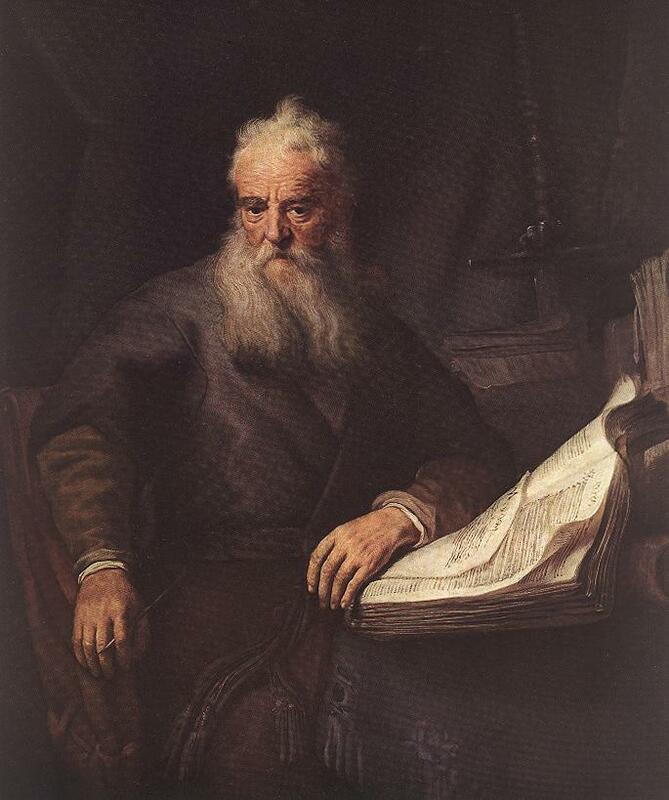 The author of the epistle of Galatians is the apostle Paul (1:1). No serious scholar questions the Pauline authorship of Galatians. This epistle was directed at the “churches of Galatia.” (1:2). However, the epistle to the Galatians could have been written to one of two groups in the province of Galatia. There are two theories as to which Galatian group the letter was aimed at. 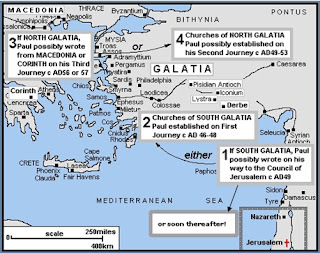 If this view is correct, Paul probably wrote the letter after he passed through Galatia and Phrygia (Ac 18:23) during his third missionary journey. Paul could have written this epistle during his two-year stay in Ephesus (Ac 19) or perhaps as he was passing through Macedonia on his way to Greece at the end of the third missionary journey. This means, if all the above is correct, that Galatians was probably written around a.d. 53 to 57. This would put the writing of Galatians in the same time period as 2 Corinthians, Romans and Philippians. These letters share some common concerns. This letter was probably aimed at churches located in north-central Asia Minor, around Pessinus, Ancyra, Tavium). The Gauls settled here after they invaded the area in the third century B.C. 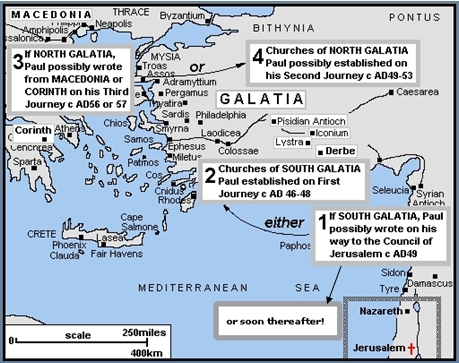 The letter was written to the southern area of Galatia with cities such as Antioch, Iconium, Lystra, Derbe. Paul founded churches in these cities on his first missionary journey. If he did write to southern Galatia, he probably wrote to them early in his career. It could have been written soon after the time of the Jerusalem Council (Ac 15; Gal 2:11-14). The date therefore could have been as early as A.D. 49. This could make this epistle to be the earliest of Paul’s epistles in existence today. Paul writes in the first chapter of his amazement that the Galatians were deserting God, who called them by the grace of Christ, for a different gospel (1:6). In fact, he explains that this different gospel is not another gospel but a distortion (1:7-9) by some who are disturbing the Galatians. These Judaizers agitated the Galatians in two ways. They preached a false gospel to the Galatians (1:6-7; 4:10) and attacked Paul personally trying to get the Galatians to side with them (4:17). There are basically four things that the Judaizers taught. First, they preached that one needed to be circumcised in order to be saved (6:12). This, in simple terms, meant that they taught salvation by good works. In effect, one had to follow the Law in order to be saved. Second, they taught that one had to be a member of the nation of Israel to be accepted (Mt 3:9). Third, they included in their teachings that it was very advantageous to occupy an ecclesiastical position in the religious system of Israel. Fourth, a righteousness acceptable with God was only possible by faithfully keeping the Law (Rom 9:30-10:3). Naturally, the Galatians listened to these rumours and it affected them. Since they had already started deserting the true gospel, Paul had to respond. The epistle to the Galatians is the result. Paul attempts in Galatians to persuade them that no Gentile needs to accept the Jewish Law in order to belong to God’s people. Entrance into the community of faith is by faith in Jesus Christ. Paul is very adamant that any gospel that adds the Law to it in any form is a cursed gospel (1:8-9). In order for Paul to be persuasive, he shows that the rumours spread by the Judaizers about himself are untrue, and he continues to show them his true calling as an apostle (1:10-2:14). Once this is dead, Paul moves on to defend the gospel against the false teachers (2:15-6:16). Paul shows that it is by faith alone that we are justified (2:15) and that anyone who wishes to follow the Law is cursed (3:10). In this he shows the freedom in the gospel. Christ redeemed us from the curse of the Law (3:13). There is no need for any Christian to walk under any curse, since Christ has redeemed us from the curse. Since Christ and faith have come, the Law is no longer our tutor (3:23-25). Christ and not by the works of the Law!